Today’s episode of Yeh Rishtey Hain Pyaar Ke starts with Abir (Shaheer Sheikh) seeing Naman and goes behind him, but Naman hides behind a pillar. There as Kunal is signing the papers Vishambar comes and seeing him is shocked and asked what is he doing here. 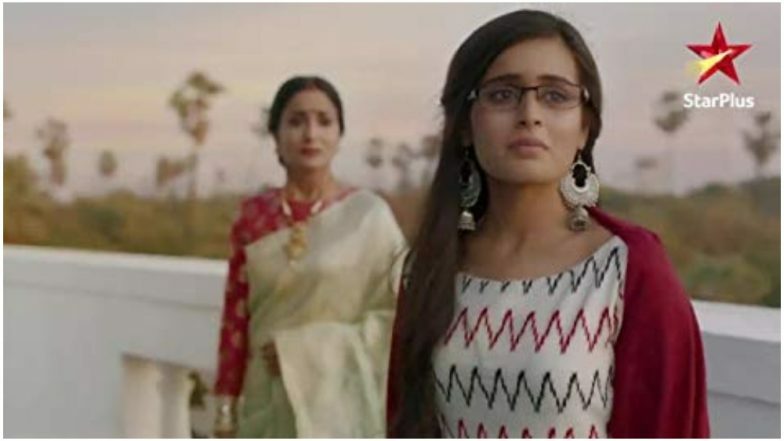 Naman calls Rajshree, and congrats her for a new bodyguard, Rajshree says that she does not know what he is talking about, Naman says for how many days he will save Mishti (Rhea Sharma) and that one day he will come and tells her to keep the money ready. Rajshree thinks Naman is talking about Kunal. Meanwhile, Kuhu is upset as Jasmith taunt her but Varsha tells her not to get affected by people and leave her life happily. Kuhu promises that she will forget what had happened and live her life to the fullest. There as Mishti is reading the book, Abir comes there. Mishti questions him how come he has come here and asked if Kunal called him. Abir asks how is she feeling now. Mishti says she thinks when she had fallen she thought Abir was there but she is not sure about it. Abir says not to put pressure in her mind and tells he was there but Kunal had brought her in the hospital. They both have a good time talking with each other. There Parul is telling Meenakshi to rest as her legs have swollen. Meenakshi says that by now Kunal might have reached London and he will manage the work there, so she can rest. Meenakshi tries Kunal’s number and comes to know that he is still in Gujrat and thinks why he has not gone till now. In the hospital, Kunal comes and tells that Mishti is fine and the doctors have told that she can be discharged. Kunal asks forgiveness for what all happened the day before. Vishambar says to forget what all happened. There Meenakshi thinks if Kunal has not gone to London then where is he gone, Rajshree and Vishambar are impressed with Kunal’s nature. Meenakshi calls Kunal but Mishti picks up the phone and hearing a girls voice she is shocked as who is she. Mishti gives Kunal’s phone to the nurse and tells if he comes then she should give it to him. Kuhu is making a cake for Mishti, as she was hurt because of her, just then Mishti and all come, seeing her like this Varsha asks if she is fine. Mishti gives a phone as a gift to Kuhu as she was upset. They both say sorry to each other and hug each other. Rajshree tells Mishti to take rest for some time. Rajshree tells that this all is done by Naman and that he will hurt her again if he did not get the money he wants. Rajshree tells Varsha that Kunal saved Mishti and took care of her. Rajshree says that Kunal and Mishti’s alliance is good, Kuhu hears this and gets upset and runs out of the house. In the precap, Mishti and Abir are having some quality time with each other.